Welcome to the Darkness Patch for PSO PC. This patch changes the darkness effect in freeplay and the offline quests to look more like it does in the Dreamcast version of the game. Instead of creating total darkness, the patch provides a pool of light around your character to let you see things nearby. 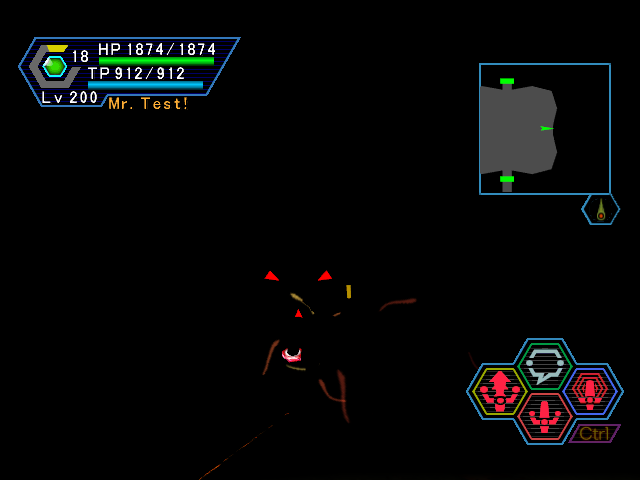 For an example image of the effect, please visit the topic about this patch on the PSO Palace forum. but it might be different for you. This folder contains files like "pso.exe", "autorun.exe", and "online.exe". There should be a folder named "Media" here. Go into this folder, and then go into the subfolder "PSO". Paste the 12 quest files here. Windows will ask if you want to overwrite the files and warn you that they are Read-Only, so say yes to both prompts. After this, go back to the "Darkness_Patch" folder and enter the "New\SET" folder. Copy the additional 38 files here, go back to the "PSO" folder of your game installation, enter its "SET" folder, and paste the files. After you say yes to the overwrite and Read-Only prompts again, the patch is installed! If for some reason you want to restore the original darkness effect, perform this same procedure, but instead copy the files from the "Sega" folder. Even though this patch applies to the offline quests, there is nothing you need to do in the "QUEST" folder of your PSO installation. The offline quest maps are stored in the main "PSO" folder. This patch also fixes a bug in the quest "From the Depths" that could cause you to lose the ASH NPC in the first room of Ruins 3. This project was pretty straightforward. After discovering this technique to improve the darkness effect in PSO PC quests, I thought it was time to apply it to freeplay and the offline quests, too. Although the new effect doesn't look exactly the same as the Dreamcast one, it seems to be about as close as PC can get to having "proper" darkness. At least it's finally possible to see nearby obstacles like rocks in dark rooms instead of having total blackness. That's the end of this README; I hope it helped with the installation process, and I hope you find this patch useful. Don't forget to visit PSO Palace, the home of this patch and hopefully the place where you downloaded it. As you can see from the map, I'm standing in roughly the same spot in both images. PC doesn't seem to be capable of exactly replicating the effect used on the Dreamcast (which applies to a lot of effects in addition to this one...), but the new one is a lot closer than how it looks normally. Yay for not stumbling around and being able to see yourself? Not that I play the PC version, who knows maybe I will someday? but props for getting this done. Good stuff. question, why did you do this the stupid way, ie edited the entry number on each darkness number, instead of just editing the entry itself in the data file and would have taken about 20 seconds to do and not have issues with languages etc? The map files are universal, so the patch works with all languages. Multiple values yield similar effects, and even Sega did this on some BB quests. Using specific values can give an even wider field of view than this does, so maybe the effect number is using bitflags, or something. I don't know anything about the fog file, so this was an easy way to get the desired result.